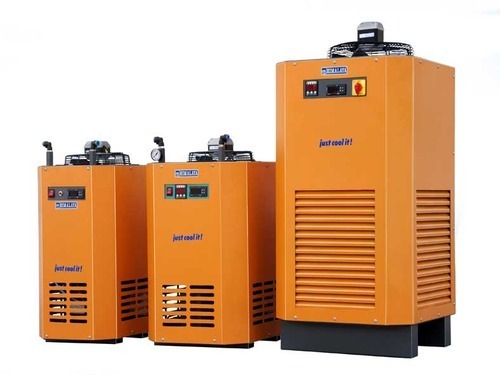 Providing you the best range of Refrigerated Air Dryer, Heatless Air Dryer and Compressed Refrigerated Air Dryer with effective & timely delivery. We are the dynamic, business-oriented organization, ranking among the utmost entities in providing a wide assortment of Refrigerated Air Dryer. The offered air dryer is manufactured using high grade components in compliance with set industry standards. The offered air dryer is highly appreciated among our clients for removing the moisture by cooling air at certain present temperature. Additionally, this air dryer is rigorously checked by our quality experts against different quality parameters to ensure its optimum performance. The basic principle of operation of the Refrigerated Air dryer is the removal of moisture by cooling air to certain present temperature. There is no process known for producing cold, there is only heat removal. Heat is always attracted by the cold body. This is the basis for the operation of a cooling unit. As long as the temperature of the cold body is lower than the hot source, there will be heat transfer. The air entering the system enters into the precooler. An pre cooler is a heat exchanger where the incoming hot air is being cooled by the outgoing cold air so as to reduce the heat load for the evaporator and thereby the refrigeration system. The air from the pre cooler enter into the evaporator. In evaporator the cooling, heat removal is done by the boiling refrigerant. The air with condensate, enters into moisture separator, where the moisture is removed by the centrifugal action of air.